It is, at the moment, 91 F in my former home town of Urbana, IL, the dew point is 75 F, the relative humidity is 59%, and the Heat Index is 102 F! In Toronto, Canada, it is 33.3 C (92 F) in the humidity is 46%, the dew point is 67 degrees and the Humidex is 40 C (104 F). In contrast, where I live here near Seattle, the temperature is 73.7 F, and Weather Channel reports that "it feels like 77 F" (that's a jargon for the Heat Index.) The humidity is 57%, the dewpoint is 58 F.
What do these numbers mean, and how are they related to each other? First or all, a disclaimer: when I put those last numbers about temperature, dew point, and humidity into the NOAA government calculator that I cite below, I do not get the same answer as Weather Channel (77F); I get 74 F. Either way, it's very comfortable here in the Pacific Northwest compared to conditions in the Midwest and eastern U.S. See below for further comments. One difference is that Canadians use the Centigrade scale and we are stuck with the awkward Fahrenheit scale. However, it is possible to go back and forth between the two scales with some rounding off. A simple way to interpret the Humidex is that it is equivalent to the dry temperature--that is, if the temperature is 30 C (86 F) and the calculated Humidex is 40 (104 F), then the humid heat "feels like" a dry temperature of 40 C (104 F). where the c's are constants, disputed by experts. 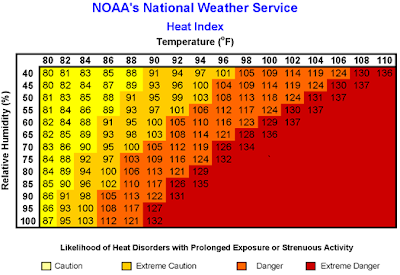 The Humidex is higher than the US Heat Index at a given temperature and humidity. A mathematical scientist looking at these two formulas would instantly wonder two things: it's amazing that they are even close to each other because of the difference in form, and they must apply over very restricted temeprature ranges because of the nonlinear dependence on R (relative humidity) and temperature (T). Here's a national weather site that allows you to use either F or C, and either Dew Point temperature or relative humidity, to calculate the Heat Index. (The numbers will be slightly off because of rounding errors.) Here's a commercial site for calculating Humidex. Note that by the U.S. Heat Index chart, our Seattle conditions at 73.7 F aren't even worth putting on the chart! And, my guess is that the reason the calculators that I provide here give wierd answers for the Seattle situation is that the formulas just aren't very good at these "low" temperatures. Canadian scale is "Celsius", not "Centigrade". Basically the same thing, but the name is different and we never say Centigrade.